I want to SHOUT OUT to Troy of Life.Aisle for the Versatile Blogger Award nomination! He is funny and inspiring and irreverent and worth the read to be sure. PLEASE do your self a favor and pop over to Life.Aisle! Awards are a way to honor a blogger you read and find inspiring, funny, interesting and/or all of the above. I have been nominated before and am truly tickled to be honored again. I have found NEW blogs that I am reading the deserve a SHOUT OUT too! and just skip right to new nominations. You know some stuff about me; I am skipping #3 this go-round. I want to introduce some NEW blogs that I adore! 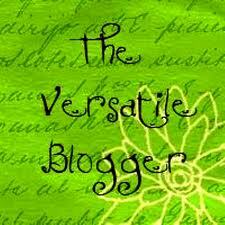 Add the “Versatile Blogger Award” pic to your blog post. PLEASE do yourself a favor and visit these blogs! Thank you ALL for adding to my life with your writing!